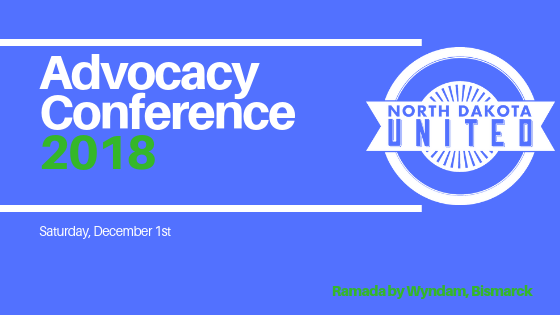 North Dakota United’s 2018 Advocacy Conference will be focused on relevant issues for all educators and public employees including the 2019 ND legislative session, how to take action, school safety, bargaining for the common good, organizing 101, and public relations. The one-day event will feature a combination of panelists, break-out sessions, and interactive activities. There is no registration fee for NDU members. Breakfast and lunch will be provided. North Dakota United will provide financial assistance to locals having members attend the Advocacy Conference. NDU will reimburse locals for one-half of the double room rate of $99.65 at the conference hotel , including taxes for each member requiring an hotel room when necessary and for the cost of one car per local at the standard IRS business rate of $.545. NDU’s assistance is intended to assist locals in sending participants. Locals are encouraged to reimburse expense not covered by NDU. NDU will not be responsible for making reservations for local participants and that no direct bill arrangements have been made for conference participants. Please call the Ramada by Wyndham Bismarck at 701-258-7000 to make your reservations.